Opening soon this center will be situated within a local landmark building in an ideal and strategic downtown location, on one of the citys main axis roads. In the heart of the CBD you will be surrounded by companies from finance, insurance and law, to name just a few. This prestigious Class A property is highly visible from major highways and the I-35W, and offers high-end office space in a vibrant commercial hub. With attractive outdoor patio area and shred spaces, this is a comfortable and efficient business environment. The regional transport links are also excellent and offer a number of frequent and convenient services in operation throughout the area across numerous networks. An ideal location for commuters, enjoy bike storage, convenient parking, and public transportation all close at hand. After work, unwind with arcade games at Up-Down, feast on fresh oysters at Stella’s, or entertain clients at Chino Latino. Whether you’re looking to launch your business or grow your existing team, book a tour today to see what this energizing space can do for you. 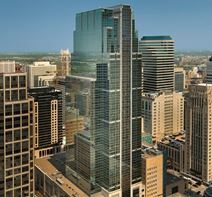 Connected to the TCF Tower and International Center by skyway this dramatic Class A office building provides a range of fully equipped and furnished executive suites with fantastic views of downtown Minneapolis. Current tenants of the business center include European consultants and advertising agencies. Many well-known companies call this business center home, and so too can you; by benefiting from the area's extensive professional services and netwroking opportunities. This is a highly accessible location, a few blocks from the riverfront. This business center is set in a Class A office block, and offers a range of workspaces to suit your needs. The communities are a great place to make new connections and learn about business topics, whether at a Happy Hour or Lunch & Learn event. The regional transport links present in the locality and its surrounding districts are excellent and provide all prospective tenants, corporate occupants and commuting visitors to the site with an array of frequent and convenient services throughout the region at large. With panoramic views of the city and fantastic local amenities, this modern workspace is ideally located in the heart of Downtown Minneapolis. As well as office space tenants also have access to huddle rooms, mothers rooms and elegant lounge ad relaxation areas as well as an on-site cafe. 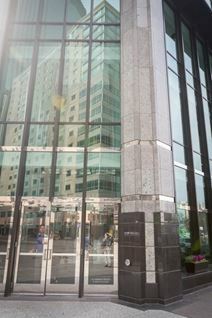 Business office suites located in the downtown area close to many amenities such as hotels, restaurants, shops and federal buildings. This centre is very large, approximately 1 mil square feet and offers two towers that is completely modern in design and layout, and equipped with all the latest technology. Includes great and helpful support staff and ample onsite covered parking. Executive offices now located in the popular Kitty-corner close to many freeways and other transport access points with eateries and shopping amenities nearby. This high grade centre offers many services such as the latest technology and telephony access and conference facilities. This centre makes an ideal working environment. The regional transport links are also excellent and make the center easily accessible. On offer, there are private serviced offices, as well as coworking spaces and virtual office options. All are available with flexible terms, and all-inclusive billing for utilities, making the payments for your office more manageable. This location is representative of some of the most prestigious and commercially significant working space anywhere in the region. The local transport links are also excellent. Located in one of America"s tallest wooden frame structures and just a short walk from Target Field Station this flexible workspace is easily accessed from downtown, the ballpark and the river. Offers both beautifully designed private and co-working office options and amenities that include conference rooms, common spaces, bike storage, craft coffee and a state-of-the-art fitness center. Rental space located near Warehouse near the federal centre at the downtown location with easy freeway access. The facility also offers lots of hotel and restaurants nearby. The building features high ceilings and lots of windows offering great views and garden on the roof. Lots of onsite parking also available.